TAIPEI, Taiwan, April 1, 2016 – Advantech (TWSE: 2395.TW) today announced upgrades across its entire range of networking gear from high-end network appliances and carrier-grade server series to its flagship Packetarium XL blade server family and Netarium AdvancedTCA systems. Powered by one to many Intel® Xeon® processor E5-2600 v4 CPUs formerly codenamed “Broadwell-EP”, the platform upgrades will allow Advantech’s customers to leverage the benefits of higher packet processing throughput and compute performance across a fully scalable product line. Networking OEMs and carriers preparing next generation product rollouts will also be able to tap into the new performance gains on field-proven systems. Platforms based on the new Intel® Xeon® processor E5-2600 v4 product family, a socket compatible replacement with the previous generation CPUs, have been successfully deployed in a wide range of applications and already offer faster PCI Gen 3 based network I/O along with the greater memory bandwidth and capacity of DDR4 technology. Built on 14nm process technology, the new processor enables Intel® Resource Director Technology, providing customers with greater visibility and control over critical shared resources like processor caches and main memory. Intelligent orchestration along with improved utilization and service levels will bring greater efficiencies to software defined infrastructure and accelerate the next wave of telecom and enterprise cloud computing. In addition to its impact on the virtual infrastructure, the performance upgrades will also bring a significant boost to applications requiring the highest speed packet handling and flow processing on Intel architecture in use cases such as policy control and enforcement, quality-of-service, network security and network analytics. “Advantech’s timely product upgrades in phase with Intel silicon release give customers a rock-solid foundation to drive performance improvements, constantly improve efficiencies, quantify time-to-market benefits and reduce overall life cycle management costs.” said Peter Marek, Senior Director of x86 solutions at Advantech’s Networks and Communications Group. The FWA-5020 Network Appliance offers greater performance in a significantly reduced 1U footprint that extends scalability and brings greater cost-efficiency to next-generation network platforms supporting demanding workloads. The appliance integrates one or two Intel® Xeon® processor E5-2600 v4 CPUs as well as a high performance, high density I/O subsystem outperforming traditional commodity servers. Supporting four DDR4 channels per socket, the FWA-5020 can be configured with up to 512GB of ECC memory using the latest RDIMM technology. The FWA-6520 Network Appliance is architected around two Intel® Xeon® processor E5-2600 v4 CPUs with a total of 44 physical cores offers outstanding I/O density scaling up to sixty-four gigabit Ethernet ports, thirty-two 10GbE ports or sixteen 40GbE ports in a modular architecture. Network Mezzanine Card (NMC) offerings allow numerous port configurations with or without network bypass, offload and acceleration. 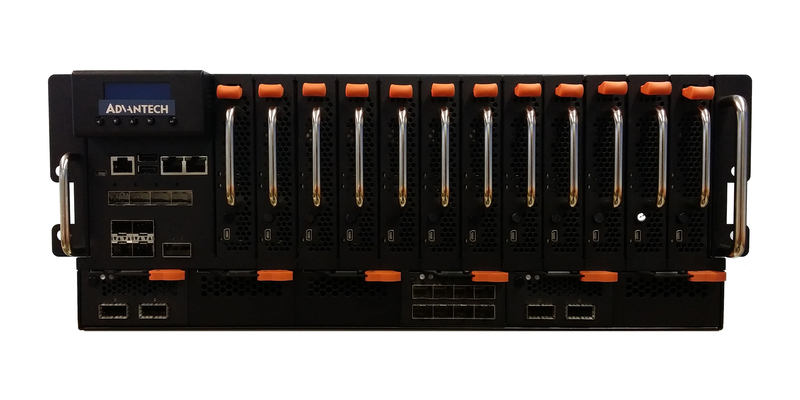 The PAC-4010 Packetarium XLe Blade Server with 100G nodeblade interconnects packs up to 840 Gbps of I/O, up to 2 Tbps of switching capacity and up to 12 Intel® Xeon® processor E5-2600 v4 CPUs in just 4RU. The integrated switch & system control module is based on a high capacity 100GbE switch managed by an Intel® Atom™ processor C2000 and provides six hot swappable PHY mezzanine module (PMM) slots to accommodate a wide choice of 10 GbE, 40 GbE and 100 GbE ports with optional LAN bypass support. The system is optimized for maximum CPU and network I/O density, enabling faster packet handling to meet the increased data throughput rates needed in enterprise networking and in telecom middle boxes. It is ideal for Network Intelligence deployments requiring accelerated packet processing performance on 10GbE, 40GbE and 100GbE ports in applications such as high-end network security, policy control and traffic analysis. The first model in the Packetarium XLe for Enterpriseseries, the PAC-4010 fits in just 4RU and reaches the performance levels typically only found in specialized ATCA or proprietary network processor-based solutions, but at a fraction of the cost. The PAC-6009 Packetarium XLc Carrier Grade Blade Server addresses Central Office consolidation and Telecom Cloud, as well as Mobile Edge Computing and C-RAN by bringing together the IT and networking features of both the Intel® Xeon® processor E5-2600 v4 and Intel® Xeon® processor D-1500 product families with its high availability and NEBS-compliant design principles. The resulting versatile and scalable NFV platform, the PAC-6009 makes it easier to deploy the same Virtualized Network Functions (VNFs) that are used in the data center or core, anywhere else in the network. The advantage is the flexibility to bring network functions out to the edge of the network or deploy NFVI in existing Points of Presence (PoPs) which cannot be remodeled as data centers. The combination of a scale out NFV platform with carrier grade features not only helps to implement service elasticity, it also helps to speed up NFV roll outs by addressing locations where commodity data center gear cannot be installed and operated. The CGS-6010 carrier-grade server is a NEBS-compliant server in a flexible and compact 2U package with a depth of just 20” making itideal for deployment in telecom, carrier cloud and business-critical networks. The CGS-6010 has been designed to maximize processing performance with two Intel® Xeon® processor E5-2600 v4 CPUs, high-density, high throughput PCIe I/O and offload on adapters from Advantech and qualified ecosystem suppliers. It targets equipment manufacturers and providers who need flexible and reliable carrier-grade computer systems for maximum uptime with best-in-class combination of compute, networking and offload capabilities. The MIC-5342 Telecom Blade and MIC-5345 Server Blade upgrades will further increase the longevity of deployed AdvancedTCA equipment in addition to the Intel® Xeon® processor E5-2600 v4 performance increase. The MIC-53xx blades with their modular FMM concept add flexibility to personalize the blade with more I/O ports, acceleration and offload. The blades can be configured precisely for the required application workload.